Sir John Hurt was an actor of many talents, revered by audiences all over the world, and with over 130 film credits to his name he was also extremely prolific, appearing in everything from historical epics like The Elephant Man and Heaven’s Gate, to big-budget sci-fi and fantasy roles like Alien, Hellboy, V For Vendetta and Harry Potter, to more contemporary and straightforward dramas like Midnight Express, Tinker Tailor Soldier Spy and 10 Rillington Place. Throughout all of those movies, you would think that he must have had to play roles that call for him to die on-screen quite frequently, and you’d be right: it has been confirmed that Hurt has died more times on-screen than any other actor – almost 50, which comes to roughly 30% of his filmography. Over the years, he’s been shot, stabbed, hanged, victim to old age, and killed by an alien creature ripping through his chest (not once but TWICE), putting even the likes of Sean Bean to shame with the incessant amount of times he’s snuffed it in front of the camera. It’s merely a coincidence that his final lead performance, in director Eric Styles’ That Good Night, is that of someone who – shockingly – is on death’s door, but even if it does just become another statistic in Hurt’s currently unbeatable on-screen death record, it also serves as a strong reminder of how much of a strong actor he truly was, even when the film itself fails to catch up to its lead star in terms of greatness. Hurt plays Ralph, an aging and successful screenwriter who lives in the Portuguese countryside with his younger wife Anna (Sofia Helin). Certain that his days are numbered, especially after a hospital visit that doesn’t bring him good news, he asks his estranged son Michael (Max Brown) to come out to his villa so he can put his affairs in order before he passes, but that becomes tricky when Ralph learns that Michael has brought along his sweet girlfriend Cassie (Erin Richards), and his insulting attitude towards her makes his relationship with Michael even more strained. Intermittently, Ralph receives visits from a white-suited man (Charles Dance) who claims to be from a society that provides a sweet relief for people looking to pass on without suffering, but although Ralph seems adamant to get it over and done with, the mysterious man urges him to perhaps stick around for a little while longer, to get everything back into its proper place before he finally dies. Putting aside for a moment the lead performance that Hurt gives, which is by far the biggest selling point of this movie, That Good Night is a bit of a structural jumble, largely comprised of short scenes where things just happen without much consequence, and which are strung together by a rather thin piece of thread. The fact that this was based on a stage play, written by the late N.J. Crisp, probably explains why there are a lot of scenes in this that seem to go nowhere, as they feel like they were hastily tacked on to make this movie seem more cinematic than the play itself probably is. Some of these scenes can be so inconsequential that they end up adding not a whole lot to the main dramatic arc of the story, and while it is completely understandable why the filmmakers added and expanded upon all of the things they did – after all, nobody wants to see a film where characters just sit around and talk at a table for ninety straight minutes – they fail to give the film the dramatic boost that it needs, outside of being reasonably well-acted by its cast (Hurt not included, for he is in a whole different category than all his other co-stars). The best scenes in the movie are when it’s a double-act between Hurt and Charles Dance, which is also when the dialogue, direction, and even the performances begin to perk up a bit. These scenes are really when the film springs to life, because not only have you got two great actors working off of one another, the results of which being a wonderful display of raw thespian talent from every direction, but their characters and the conversation that they have with each other serve as the dramatic and emotional crux of the entire story, which involves some serious discussion about the need to end one’s life before it becomes too much of a burden for other people. It honestly leaves you wishing that the film was just about these two, since while there’s nothing inherently wrong with any of the other actors or their characters, they just aren’t given as much dramatic muscles with which to flex in this particular story, outside of these two people at the very centre of it all. That probably brings this review to the absolute highlight of the film, which is, of course, Hurt himself. In a role that he could very easily have sleepwalked through, he still gives it his all, regaining that boyish and cocky charm that he excelled at earlier in his career, and makes his character not the most sympathetic person in the world, but someone who you can tell is regretting some of his previous life choices, and wants to make his inevitable departure all the more smooth for the people he cares the most about. All of that is present in Hurt’s performance, as well as a sense of mischievousness, pathos, and a sense of life which, given the fact that he filmed this in the midst of his struggle with the pancreatic cancer that would eventually claim his life, just makes it all the more admirable. There really won’t be an actor who will probably have the same amount of gravitas and screen presence that John Hurt had – or at least, the same amount of on-screen deaths – and even though That Good Night isn’t quite the fantastic send-off that he probably deserves, it is by far a sobering and heartfelt reminder of how missed this true acting icon will be. 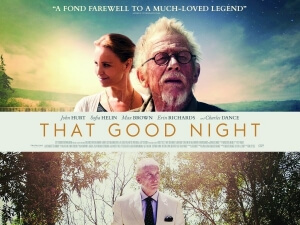 That Good Night is a strong final showcase for the late, great John Hurt, even if the rest of the film struggles to catch up to his greatness with a jumbled structure that is largely made up of inconsequential and disappointingly undermining scenes.